GoWISE USA is a popular name for manufacturing eco-friendly household products. GoWISE USA air fryer products are perfect to save your time and to improve your lifestyle. You can expect the same with GoWise USA air fryer. This air fryer is designed to enable you to enjoy your desired food and snacks without consuming too many calories. The fryer comes with fast air circulation technology to distribute hot air in all the directions for an even and fast cooking. You will also love 8 built-in smart programs. You can use these programs to prepare a pizza, fish, steak, chicken, cake, shrimp, fork, and fries. This one device is going to satisfy many of your food cravings. In addition, there will be a great temperature range from 180◦F to 400◦F. The cooking time is up to thirty minutes depending on the type of food you are preparing. You can also use the built-in alarm to check your food on five, ten, and fifteen minutes increments. All these features make GoWise air fryer one of the favorite options to prepare a wide variety of food. The GoWise air fryer offers an easy and fast way to prepare healthy food. 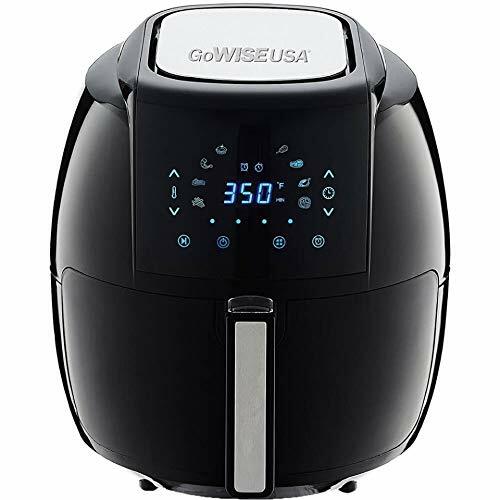 If you are interested in GoWise air fryer, you can go through the following review to know more about the features, benefits, downside, and the reviews of users. With the GoWise air fryer, you can prepare your food without added calories. You can use this fryer to grill, bake, fry, and roast your food without oil or with little oil. You can make your steak, French fries, and crispy chicken in this fryer without adding oil. The sleek design and modern look can complement any kitchen interior. It has an improved touch screen menu as well. The touch screen menu consists of eight cooking presets that include steak, shrimp, pork, chicken, chips, cake, and a few others. You can cook all these within half an hour. The XL size of this fryer can serve a family with four members. The GoWise air fryer has a Start/Stop feature button that you can use to change temperature and time even during the cooking. You can shake new built-in alarm to shake the ingredients in five, ten, and fifteen minutes. The GoWise air fryer will come with a non-stick and PFOA free pan. This is FDA certified. Besides, it has a detachable basket with the button guard and cool touch handle to ensure safety as well as to prevent accidental detachments. You might prefer a recipe book with your GoWise USA air fryer to utilize it more effectively. Yes, this fryer will come with a GoWise air fryer recipes book. This air fryer recipe book covers fifty recipes that you can prepare using GoWise air fryer. These recipes will enable you to prepare your breakfast, lunch, dinner, even desserts. GoWISE air fryer can make cooking easier than ever. The rapid air technology will enable you to prepare healthy and delicious food with no oil. In fact, you do not need to limit your fried food consumption. You will have endless options that you can prepare at your home using this fryer. The fryer comes with four different color options. These are white, plum, chili red, and black. Therefore, you will not have any difficulty to choose a color that complements your kitchen interior. Another feature is the removable basket. This basket will enable the users to move their food from the fryer to the serving plate easily. In addition, once you remove the pot, the fryer will switch off automatically. The handle also comes with an eject button that you can use to separate the fryer basket and pot. With this fryer, you will get six pieces of accessories that you can use to cook anything that you want. The cookbook will help you to use all the accessories and to experiment a lot of new dishes. You can have fun and learn something new every time. GoWise air fryer has removable pots and baskets. That means you do not need enough time to separate them for cleaning. You can use a sponge and warm water to clean. Easy cleaning is always a top priority for busy families. GoWise air fryer has received both positive and negative reviews. Users appreciate easy and fast cooking. In addition, they find the fryer very useful to prepare different types of food and drinks. The setting such as the time and temperature help them to prepare their food without any hassle. When it comes to negative reviews, you will also find a few. Many users are not satisfied with the durability. As the warranty comes for only thirty days, they need to buy the parts once the period is over. Though the product has received a few negative comments on the design and lasting result, still, some users have also given positive comments on both these. One user find is durable and effective even after using on a daily basis. In fact, no one has denied that it prepares the food fast and helps to cook a wide variety of food. Now you know both the positive and negative sides of this GoWise air fryer. If you want to prepare healthy and delicious food at the fastest possible time, you should think of buying GoWise air fryer. The product is worth buying. You will enjoy your fries, steaks, pizza, cake, and anything that you want. In fact, you can prepare your favorite food in less than thirty minutes. This model of GoWISE USA comes with many improved features to enable the users to prepare healthy food more efficiently.